Some "Slay Queens" from Ghana have something to tell ladies who always ransack their boyfriend's phone. 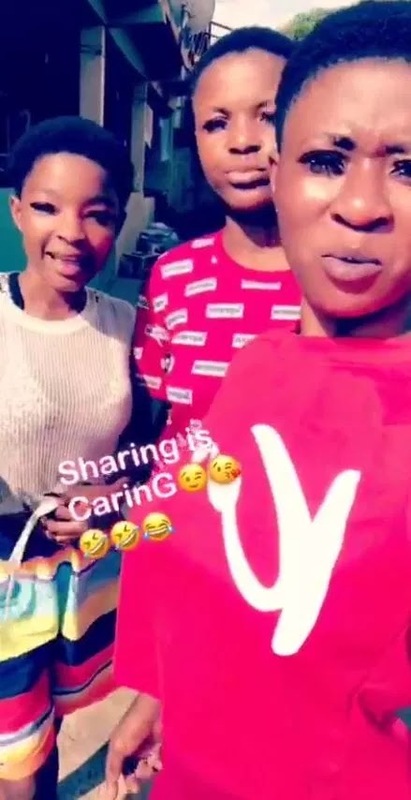 The three girls are probably not more than 19 years, videos which are now viral shows the young girls shamelessly asking other girls to stop blocking them (side chicks) from their boyfriends phone, insisting that after all he wasn’t created just to date just one person. As you can see written on the photo is "Sharing Is Caring". LOL, one of the girls even went further to ask if their (referring to the main chicks) names were written on the manhood of their boyfriend when they were born to suggest that, they were born to only f**ck them.